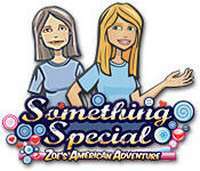 At the wedding of her sister, a young and lonely woman called Zoe is hired by her eccentric aunt to work for the "Something Special", a store of unusual and curious items. She has to travel across the United States to collect peculiar objects for the shop. This is a hidden object game, where the objective is to find and click on all the items listed at the bottom of the screen within a time limit, on locations filled with assorted objects. There are three difficulty levels to choose at the start when creating a profile. The easy mode has no time constraints and the objects are easier to find. On the medium difficulty, items are better hidden and there's a time limit of ten minutes for each location. The hard mode gives only five minutes per scene, and has well hidden objects, but after completing each chapter the player receives one of twelve unique trophies. Each location shows a museum or shop full of curious items, with some of them based on real places in the United States. The shopkeeper portrait at the bottom-right doubles as the timer and the hint button, showing the exact position of one of the required items when clicked. The hint button takes a few seconds to recharge after use. A diminishing red ring around the portrait shows the remaining time left to collect everything. There's no penalty for wrong clicks, and the story is told through a series of comic book panels.